First and foremost, never attempt to change the diet of a bird who is ill; if a bird becomes ill during the process of dietary change, return to feeding the bird what it is willing to eat and postpone any changes in the diet until the bird recovers.7 The same is true of any bird who is being exposed to multiple stresses (i.e. 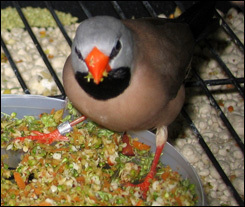 changes of environment, exposure to temperature extremes, introduction of new cage mate(s)).6 Next, understand that birds are skeptical of novel foodstuffs and must therefore become familiar with new foods before experimentation is likely.6 Many of the following techniques are based on this principle, and aim to familiarize birds with new foods to encourage consumption. To begin introducing new foods, mix them in with the bird's normal diet.2,6,7 Initially, restrict the amount of seed eaten daily to 75% of what the bird normally consumes in one day. The other 25% should be the new food(s). This way, the bird will not starve, but will be hungry for new food(s).6 Add the new foods in increasing proportions over time, and make sure all of the birds have tried eating the new food before completely removing the seed. 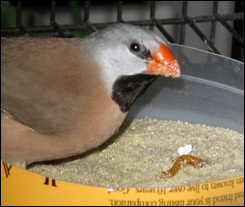 Shaft-tail finches eating mealworms (left) and a vegetable medley (right).